Frank Green is a veteran television journalist and documentary filmmaker. His career as a producer for NBC News honed his skill in telling stories to a national audience. Green's environmental documentaries have won many national and international awards and have been shown on PBS, the Discovery Channel, Outdoor Life Network and many international television outlets. 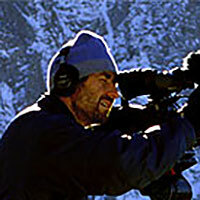 His film El Dorado won Best Film on Mountain Environment at the Banff Film Festival in 1997. Green is a fifth-generation Californian who grew up backpacking in the Sierra Nevada and all over the West. He spent 10 years as a journalist in Southeast and East Asia at the end of the Vietnam War, including several years as NBC News bureau chief in Seoul, the first American broadcast journalist stationed there. Green graduated from Stanford University and has lectured on broadcast journalism and international reporting at the University of Texas, Austin, and San Francisco State University. Green got the inspiration for Counting Sheep from a newspaper article about endangered wildlife of the Sierra Nevada. He didn't know there were wild bighorn sheep in the eastern Sierra, but when he heard that they were one of the most endangered mammals in North America and that they had never been filmed, it was "like waving a red flag in front of a bull." Three pair of boots, 15 expeditions, $70,000 in grants and 12 years later, Counting Sheep was released.